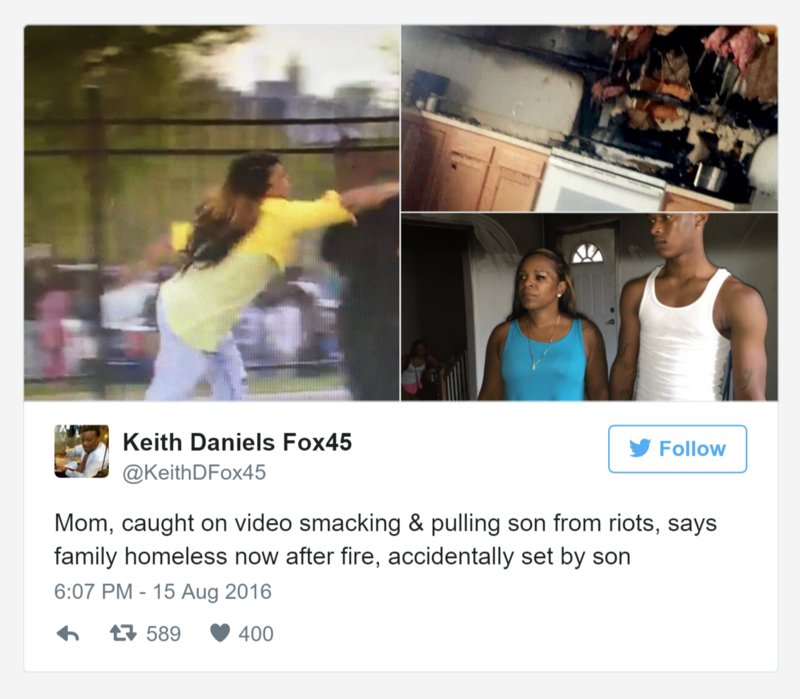 A mom made famous for smacking her son during the Baltimore riots is now homeless. After video of Toya Graham striking her son went viral in 2015, even Oprah called the mom to express her approval. “I understand what single moms go through”, said Oprah. Now Graham needs Oprah’s help after that same son, 17-year-old Michael, accidentally set the family’s home on fire while frying chicken, WBFF reports. Michael, home alone, then threw water on the grease fire, which made it worse. Now the single mother of five children and one granddaughter is homeless. The family has a GoFundMe set up to take donations. See how many come to her aid now ! Oh by the way where is her white man ? All should be good huh ? Carol R B Greene Iam not sure what you’re talking about? Or what it has to do with this incident? If you’re not going to donate? And people like you usually don’t? Then other than have some kind of low Gap or IQ score? Why comment!!! Well, people bailed out a criminal for beating up the racist white dude who shot the people in the church up. Bailed out a guy within 24 hours of hearing about the jail incident and no one knew who he was. So I’m sure people will take care of this woman right? She got all dat fame for stopping her son from rioting and nobody to help her now that she’s homeless. Where all then white people who had her back for the moment? Honest to God, I have empathy for Black women trying to take care of their children. I hope she can get back on track. I’ll support her fund. What an unfortunate situation to have to go thru … I’ll definitely be making a donation. That said, I remember Ms.Graham receiving both praise and condemnation for her actions during the uprisings in Baltimore last spring, but one thing I strongly believe to be true, is that her son very much loves and respects his Mom. like Shawn responded I didn’t know that someone able to make $6367 in one month on the internet . read more…………. Makemoney10.COM????????? and beat our children to much, which I feel causes so many African people to be violent. about ourselves. The curriculum has been in place every since we went to school in America for the first time about 150 years ago.